This is Bombay Rock's first Brunswick Music Festival and we are excited! As part of the Venues 3056 events, we have an amazing line up for you on Wednesday, March 6th. Doors 6pm. Bands 7pm till late. Cheap beer, Margaritas on tap, awesome pizzas and great party guaranteed. The Go Set presents a unique combination of folk, Celtic and punk rock music. Since their formation in 2003, they have played some of Australia’s premier venues and festivals as well as extensive tours of the United States. They have played alongside bands such as The Living End, The Real McKenzies, The White Stripes, The Bouncing Souls and Flogging Molly. 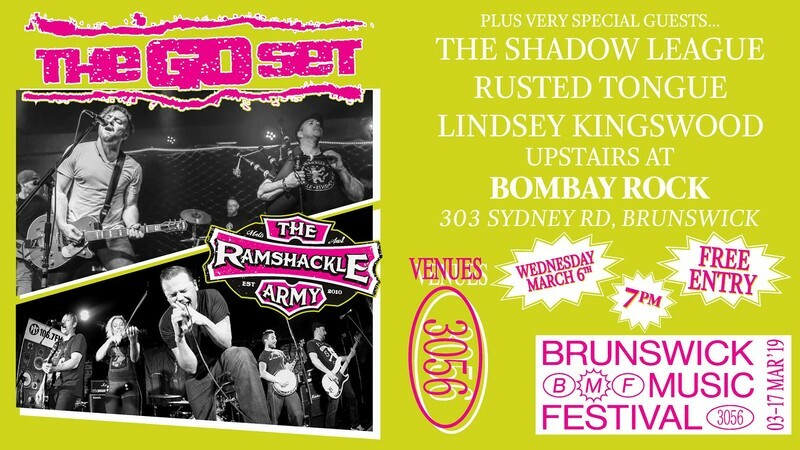 The Ramshackle Army are a Celtic punk band that has been playing the Melbourne pub scene since 2010. They have toured locally and internationally with the likes of Dropkick Murphys, Frank Turner, Flatfoot 56, The Tossers and The Mahones. Shadow League Brought up on a healthy Punk Rock diet and armed with Acoustic Guitars, Drums, Bass, all manor of folk instruments and course melodic vocals Playing as a 2-piece live, Shadow League create a big sound and a dynamic performance. With some good time, sing-alongs and incorporating dark underlying lyrical imagery will keep you wanting to listen again. Rusted Tongue is a Melbourne based band of bohemian warrior women. Bringing you music inspired by punk, folk, gypsy and blues. Guitarist and raconteur Lindsey Kingswood's sound ranges from blues and bluegrass to swamp-rock and Australian folk-rock. Influences include The Bushwackers, The Currency, Tombstones and Trampled by Turtles. Lindsey also fronts punk-rockers Australian Kingswood Factory and has never been seen out of cowboy boots.